There’s a secret to eating healthy; it is low fat breakfast! It is this meal that kick starts your day, providing you with essential nutrition and lasting energy. The choice is yours, whether you make or break your day. It is just a matter of a few basic steps to keep up with your day. 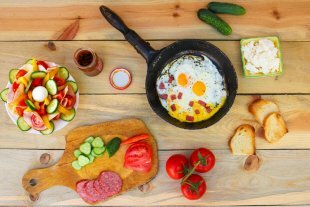 Here are some healthy and low fat breakfast ideas that will add both taste and health to your favorite preparations. 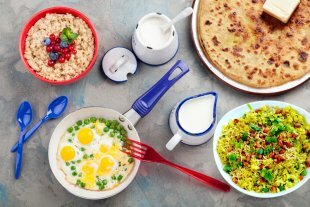 Poha, flattened rice, is extremely popular breakfast option across India. Use variety of vegetables such as carrot, beans, potato, green peas, cabbage, peppers, capsicum for a power punch. 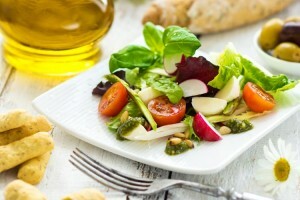 Use Olive Oil-Extra Light in preparation to keep unhealthy fats at bay. Paratha is the most common breakfast item in Northern India. These are often considered unhealthy owing to the amount of oil used in their preparation and the contents. Prepare paranthas using whole grain flours, with a stuffing of healthy ingredients like low-fat paneer or veggies. Saute with Pomace Olive Oil or Olive Oil-Extra Light. Upma is a popular traditional breakfast in Southern India, made using rava (suji). To make upma, heat 1 tablespoon Olive Oil-Extra Light and add rava to it. Add some boiled veggies to make it healthier. Fried breakfast is considered unhealthy but it does not have to be. The health benefits of olive oil are especially apparent when frying; it hardly penetrates the food, leaving it light and digestible. Frying with Pomace Olive Oil can keep your favorite puris healthy. Now you know how to make them, right? High in protein, omelet is a powerhouse of energy. Use Pomace Olive Oil or Olive Oil-Extra Light in preparation to give it more power. 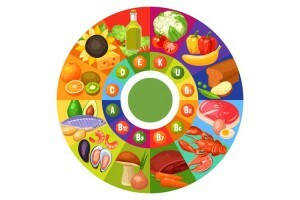 Further, adding vegetables such as broccoli, spinach and red and green peppers provide antioxidants and vitamin boot. Running late for work or have an errand to run is no excuse to skip breakfast. Many confuse coffee for breakfast on the go which is not such a good idea. Even if you’re in a rush to reach work or hurry, there are plenty healthy breakfast choices to get essential nutrients and lasting energy. A bowl of milk with corn flakes or oatmeal. Don’t skip most important meal(low fat breakfast) of the day. When in a hurry, just grab a fruit or pour yourself a glass of milk for a little bit of energy. 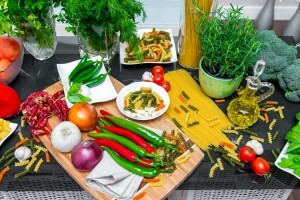 Previous How is Olive Oil a Super Food?